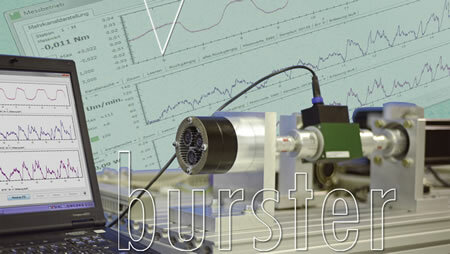 The recently announced 8661 series dual-range precision torque sensor with USB interface from Burster GmbH is now available from Ixthus Instrumentation, the German precision sensor manufacturer’s UK supply partner. With a single sensor covering two torque ranges - 0...5 Nm and 0...200 Nm - the new 8661 model is raising the standards bar and the convenience for the measurement of static and bi-directional torque for the laboratory, production test and quality assurance. The USB version of the 8661 is supplied complete with Burster’s powerful DigiVision data acquisition software as well as DLL and LabVIEW drivers. The plug-and-measure software includes an auto-scaling function with numerical and GUI display of torque values with editable and downloadable mathematical factors and results. Further options for the 8661 include speed and angular displacement to 0.09 degrees which can also be combined in the DigiVision’s data acquisition as well as the mechanical power values calculated by the sensor. Up to 32 measurement channels are supported and a powerful editor allows calculation of values such as efficiency and smoothing averages. With no need to change sensors for varying product or test stand set-ups, the 8661 with USB is well suited to field portable and factory applications in industrial automation, engine & power transmission testing, turbines, electric motor test - and demanding rotary torque measurement in research, medical industries and more. The sensor is supported with matched accessories such as couplings and mounting blocks, and traceable Burster factory calibration certificates or DKD (German Calibration Service) documents can be provided. The 8661 series is also available in other dual-range models as well as single range versions from 0...0.2 Nm up to 0...1000 Nm - with similar options for USB interface, speed and angular displacement measurement etc. Ixthus works closely with leading global suppliers of non-contact sensing technologies as well as force, torque and vibration sensor and transducer manufacturers, providing a complete service with its knowledgeable technical staff available to solve customers' measurement problems - from the first enquiry to complete after-sales support.